Over five months in and we had our first visit back to the mainland this week. The bright lights and razzledazzle that is Fort William! Supermarkets, McDonalds, Boots the Chemist, people, traffic, noise…. Clearly the honeymoon period has yet to wear off for us because we currently miss nothing about the mainland (family and friends excepted). Sure we love the cinema, theatre, museums etc but realistically they were infrequent treats rather than day to day life. If we want infrequent treats we can still have them, just not quite so often and at greater expense with more planning required. We’re only 100 miles (and a ferry trip!) from Inverness, there is a cinema / theatre on Skye, we can hold film nights here on Rum and we’re hoping to put together a fabulous schedule of events and visiting attractions right here next year. There is nothing you can’t order online and get delivered and the excitement of getting a new clicky thing to light the gas rings through the post as a parcel will never wear thin compared to just nipping to the supermarket and buying one :). The reasons for our mainland trip were to get Bonnie spayed and for Dragon to have an appointment at the eye department which was a referral to our GP from a routine opticians eye test back last year that we failed to get sent through in Sussex before we moved so had transferred up here. We originally were supposed to go off at the beginning of September to do both but the hospital cancelled the appointment so it was all rescheduled for this week instead. It all took precision planning; checking ferry times, joining the local car club and getting documents printed off, signed, verified, membership paid for, car booked and arrangements to collect it made. By very happy coincidence our dear friends who are now considered family traveled back to Rum with us for a visit and had booked a holiday cottage large enough for us to stay too so instead of an expensive and cramped stay in a budget family room in a large chain we had the luxury of a gorgeous holiday cottage with bath, sky tv, large kitchen and space. 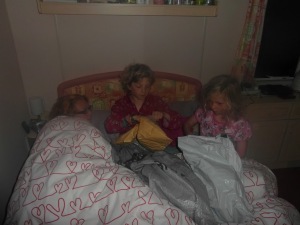 That was the highlight of our stay really, being with friends in such nice accommodation, oh and meeting someone in McDonalds who we met on the day we moved to Rum and got chatting to in Mallaig as we waited for the ferry to take us off to start our new lives. They recognised us and were really pleased to hear we have settled in so well and are so happy here. Determined to find silver linings and rescue the justification of the expense, car hire, ferrry prices, time away from home and need to call in favours in animal sitting back on the croft we did manage to combine our trip with our first visit to neighbouring Canna for a couple of hours. We didn’t meet any of the islanders and although it is nice to have visited we certainly didn’t fall in love with Canna like we did with Eigg and Rum on our first trips. We’ll go back, probably next summer for a full day trip but it was great to have finally got there and to have seen another edge of Rum’s coastline that we’d previously not navigated. We also spent lots of time filling up the car with shopping. Tins, jars, bottles, supermarket own brand stuff that will see us through – long life milk, tinned fruit, vegetables, meat and fish for those Famous Five times when we’re cut off from food deliveries by cancelled ferries and need to wash down our tinned feasts with lashings of ginger beer. We bought Dragon and Star’s chocolate advent calendars ready to stash, Ady and I got a thermal base layer set each, I stocked up on socks, both Dragon and Star spent some of their cash stash on toys, we visited a sweet shop, bought kitchen bits like new scales, whisk, pastry brush, cereal bowls. On Friday morning we were not at all sure the boats would be running but got to the ferry, loaded our stuff on the van for Rum and paid freight, nipped to the CoOp and stocked up on loads of meet to stash in a friend’s freezer to see us through the next few months, parked the car and returned the keys and then got on board. It was a rough crossing and we were greeted at Rum with one of the most severe hail showers I have ever seen but it was fab to be back. We’ve a crazy couple of weeks ahead with visitors galore before I suspect it will all go quiet for the winter. We’re still getting batterings from the weather and although with every storm I get a little more confident at the static’s ability to stay put we will be packing an emergency bag and stashing it in the car tomorrow and going through some evacuation procedures with the kid so that in the event of a middle of the night loss of the roof or similar we all know what we are supposed to be doing. Hopefully having a plan and a packed bag will be enough to guarantee it is never needed. 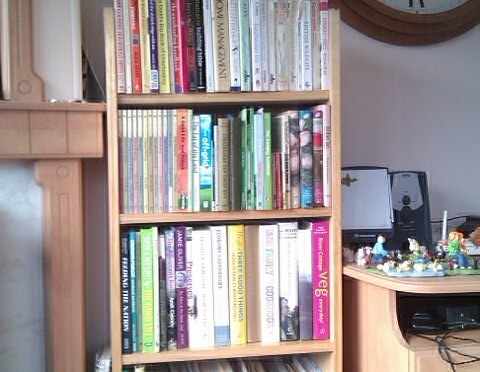 Ady has been down helping at a friends’ house this week during the mornings leaving the kids and I to our own devices. We’ve done various things with this time but today the sun was shining and I was up for a bit of time to myself, just me and Bonnie to enjoy the croft in the sunshine. Dragon and Star stayed in the static to do some tidying of bedrooms / playing while the dog and I set off with some empty punnets to fill with blackberries. We ended up being out for nearly two hours and it was just blissful. The sun was shining, the sky was blue, it was crisp and clear with a nip in the air but enough warmth still in the sun to keep it enjoyable to be out in. As Bonnie and I scrambled over a fence (from the outside of our croft to the inside I hasten to add, no trespassing!) I experienced one of those moments of pure happiness and being in precisely the perfect place at the perfect time. A freeze framed moment to keep safe in a bubble preserved forever. One of the things I have noticed about our fellow islanders is their love and respect for Rum. Noone here just views the island as the place where they live, it is not just a postcode, just your address or your neighbourhood. No one is here with grand plans to ‘get away from this place’. In this respect it is so very different to anywhere else I have ever lived. The same goes for people’s jobs here – no one is biding time, hanging out til something better comes along or moaning about wanting to leave and looking for a different job. It’s simple, everyone is here because this is where they want to be. When it stops being where they want to be then they leave. Life is tough enough here for it to only work if this is truly where you want to be. When Ady and I got married, in a Las Vegas wedding chapel (no, not by Elvis!) it was by a very American ‘preacher man’ type guy who struggled with my name (in America they don’t have the name ‘Nicola’ – it’s Nicole, so he kept calling me ‘Nicole-ah’) and clearly performed hundreds of ceremonies, conveyor belt style every week. But he did take the time to chat to us before the service, learn a little about us and discover why we were there to get married and what it meant to us. As we slid our wedding rings onto each others’ fingers he told us ‘never let them only mean you’re married’. It’s a phrase that 13 years on I still think of regularly. Every time I fiddle with my wedding ring, or feel Ady’s ring as we walk hand in hand, or scrape dried on bread dough from mine after I’ve baked bread I am reminded of that. Our wedding rings are not just a physical reminder that we are married, they are a symbol of being married to each other, a little piece of each other that we wear with us every single moment, awake and asleep, in sickness and in health, even when we are annoyed or cross with each other, together or apart. Today in my moment of walking up our hill (those who live here or have visited will know about our hill…), Bonnie by my side, a full four punnets of brambles ready to be made in to jam in the bag over my shoulder, sun shining down, panoramic view all around I was reminded about never taking this forgranted, never letting it only be where I live. To always feel the wonder, the awe and the excitement of this being where I get to call my home. It’s five months today since we drove off the ferry and on to Rum to make our home here. Next week we leave for the first time back to the mainland (only for a couple of nights). Five months! It’s gone in a blink of an eye and in some ways we still feel so very new here, yet in others it feels more like home than anywhere else has ever done and we already have so many memories and here. September is probably our most eventful month for anniversaries and celebrations and has always felt more like the start of a new year than January does – likely a hangover from being a schoolkid and the Back To School feeling of new stationery, new uniform and new school year. It’s the month we married in and the month we first became parents in 1999 and 2000 respectively. Since not sending our children to school and being Home Educators we have often celebrated Not Back to School with picnics, park visits and hanging out on beaches or other unschool-y locations in September, just because we can! In 2010 (almost to the day) we bought Willow in September and in 2011 we were just starting out 6 weeks of travelling around Scotland in Willow wild camping and falling in love with this part of the world. This September sees us once again getting to grips with yet another way of life as we try to winter-ready ourselves, the croft, the static. We are researching house build options and in talks with a designer about possibilities. We are crowdfunding frantically (nearly 20% of the way there with just 46 days left to go) and today was the last Sheerwater boat trip of the season with the seabirds and cetaceans coming out to wave us off in style til next year and sightings of minke whales, porpoises, gannets, geese and gulls. Some things remain the same throughout September though, ever since I was a child. The light seems to have that changing season magic about it – skies are somehow bluer when the sun is that bit lower in the sky. The mornings and evenings are clear and crisp, it’s the best time for star gazing (and we definitely live in the best place I’ve ever been for stargazing – we have spent more time standing looking skywards in the dark in the last few weeks than in my whole life I think! ), seasonal food is fabulous with apples and blackberries providing feasts for free. Every load of washing you manage to dry out on the line feels like a last minute bonus, every day without a coat with the sun still warming your back a snatched treat to keep you going til spring. Today I wore a hat for the first time, last night I took a hot water bottle to bed. I’ve been looking at thick socks and winter weight duvets online. The wasps are drowsy, the midges are all but gone, thoughts are turning to fireworks and bonfires. The leaves are turning to gold and today we watched great skeins of geese fly in formations back for winter while other birds are preparing to fly away. and there are a lot of clouds here on Rum! Fortunately there is a lot of sunshine too. I think I have seen at least two rainbows every day for the last week as the weather changes rapidly from showers to sunshine and back again. There is a definite chill in the air though, it’s dark by 830pm and the cuilins are turning from green to purple as the heather flowers and the trees are losing their leaves. I love autumn, it’s a forager favourite season and a feeling of promise in the air..
We’re not without challenges though and just as we think we have life on Rum sussed so we realise we still have so very much to learn. As the nights draw in and the daylight hour count lessens every passing day we are not getting the whack of solar power into our batteries and are using lights for more hours each day so we are draining our battery every few days rather than every few weeks. The generator is on more frequently and we are now rotating four batteries between the pig fence, the internet, the water pump and lights and the boathouse where we charge up the spare every more frequently. We have been caught out far too many times with leaving our car the wrong side of the river so that heavy rain cuts us off and I suspect we’ll continue to get that wrong meaning long walks to and from the village and the ferry carrying heavy things. Hurrah for wheelbarrows! We all have wind up torches which are proving invaluable and next week when we head to the mainland for a few nights we’ll be stocking up on candles, tealights and tinned goods. The rain is not such a problem as the wet clothes it produces. We have waterproofs and they do work (with the inevitable casualties of wet socks or wet collars as drips make their way past cuffs and collars) but we don’t have anywhere to hang them when we come in and take them off. We put them in the shower to drip dry but we are fighting condensation every step of the way now so bringing wet clothing in just adds to the problem. I’ve been lurking on caravan forums trying to find tips and hints to combat it but aside from not cooking or breathing and leaving windows open all the time the only other option seems to be a dehumidifier – not really a choice for us! The cold is edging in with all of us doing fair impressions of dragons in the mornings and evenings but hot water bottles and extra jumpers and socks will combat that with additional lines of defence in sleeping bags and high tog duvets ready to be brought out before we resort to putting the fire on. Poor Bonnie had her first run in with another dog last week and is sporting a hurt ear which she is doing her best to make worse by scratching. She is off to the vets next week anyway to be spayed and we’re keeping a close eye on her and taking her for a dip in the sea each day to help clean it in salty water. It’s hard not being able to pop along to the vets down the road though. And pants – and socks! We all need them, the kids need new winter tops too and Ady needs waterproof trousers. All perfectly gettable from the internet but not nearly so quickly and easily as popping along to the 24 hour supermarket. Except of course that not being near a 24hour supermarket was on my list of reasons to move here in the first place! We have less than 50 days to go before the crowdfunder website closes on our compost loo bid – we can still carry on raising money of course but it would be great to manage to get it done through that website. In order to up the ante a little we’re pledging a new toilet humour joke for every extra £10 donated – that could be a lot of jokes about poo! A busy week for us here with friends staying Monday to Friday and getting to sample a slice of our lifestyle. We’ve a busy month or so ahead with several more sets of family and friends coming to visit before it quietens down for the winter. We are already filling up with planned visitors for the spring next year though so I’m sure we won’t be lonely for friends. It was lovely to see The Barts who are in the throes of planning an adventure of their own for next year (and maybe beyond!). 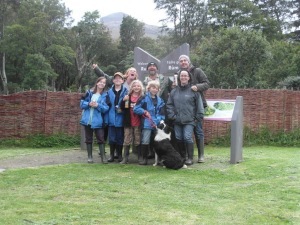 It’s amazing to think it was two years ago now that we were planning our WWOOFing year and we are coming up to the anniversary of our first ever visit to Rum soon too… someone said to me just this week that they can’t imagine Rum without us already – it’s lovely to feel so at home here and helps prevent itchy feet when listening to friends talking about their travels. We had a great week, weather aside, with them. Introducing them to our island friends, showing them some of our favourite spots on the island and sharing our new life with them. 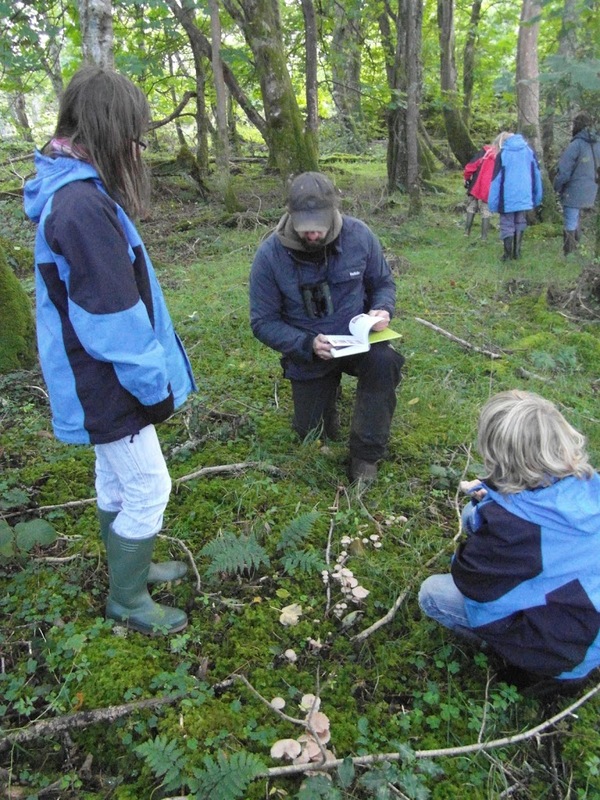 We went to a Ranger event on fungi where we walked the woodland searching for mushrooms, found some and identified them and even tried a few carefully IDd varieties. note it is still dark outside the window! Dragon was born at 435am, so he was 12 when he woke up but only just! his favourite breakfast of home made cinnamon rolls and a morning spent with friends playing with new toys. 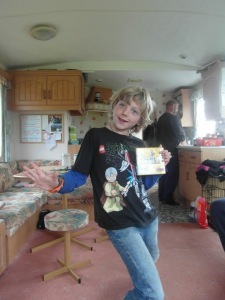 He had a visit from Ranger Mike bearing card and gift which was greatly appreciated and the afternoon ferry brought yet more cards and gifts from family. Quadruple layer! Sadly it was just too tall for it’s own stability and shortly after this photo was taken and before anyone else saw it the top three layers slid off! 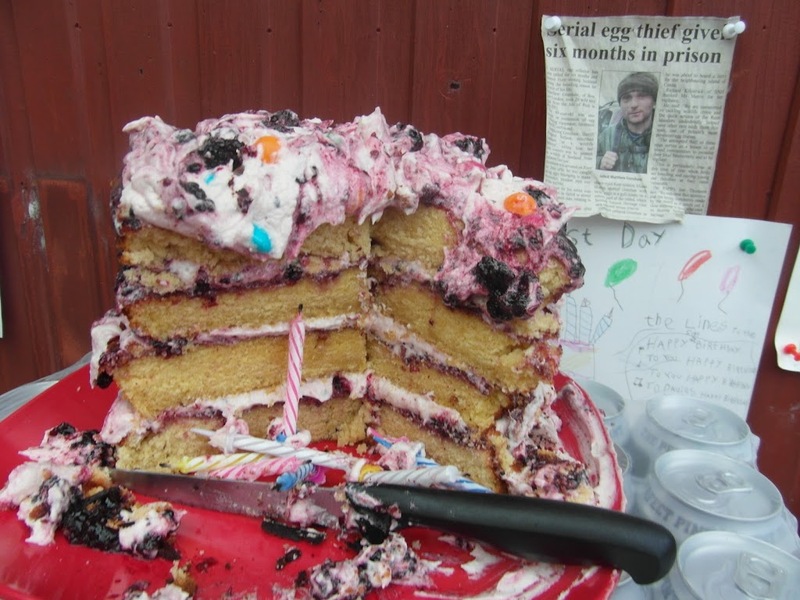 The repair job meant it was nothing like as gorgeous looking by the time it came out with 12 candles lit on top but it still tasted good! Considering we have been here only just over four months we were amazingly touched at the thoughtfulness and generosity of our fellow Rumics to Dragon. 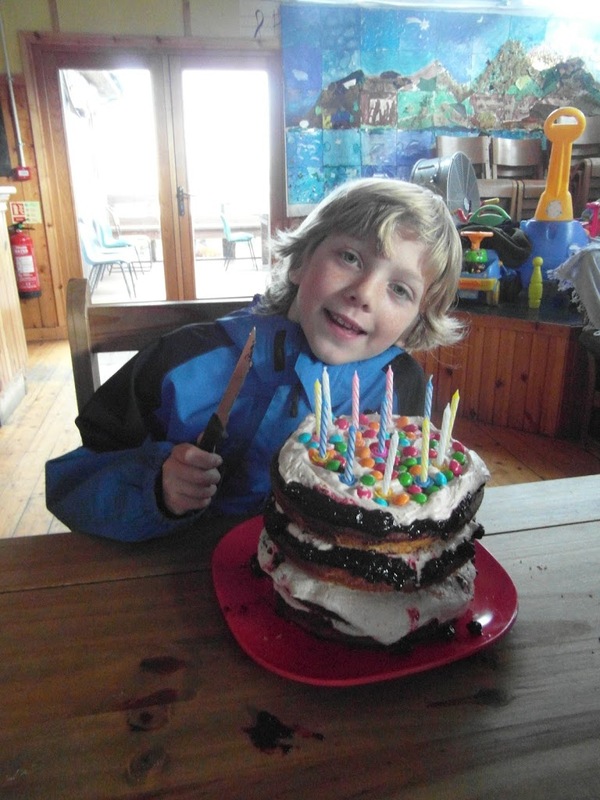 The shop was decorated with tinsel and streamers and crackers, he was given some fantastic gifts from our friends here and it made his day to have so many people turn out to sing Happy Birthday and cheer as he blew out his candles. One of his birthday wishes was to have a card signed by lots of the islanders and I know he’ll add this birthday memory to his many other good ones from previous years and consider it another fab celebration of his special day. He spent a very happy hour the following day creating thank you cards for everyone with personalised drawings of him using whatever gift he’d been given and a message inside to say why he loved his present. 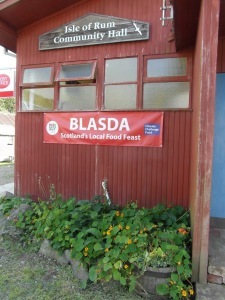 Saturday saw us waving off The Barts and turning our attention to Blasda – a celebration of local food on Rum joining in with various celebrations across Scotland. 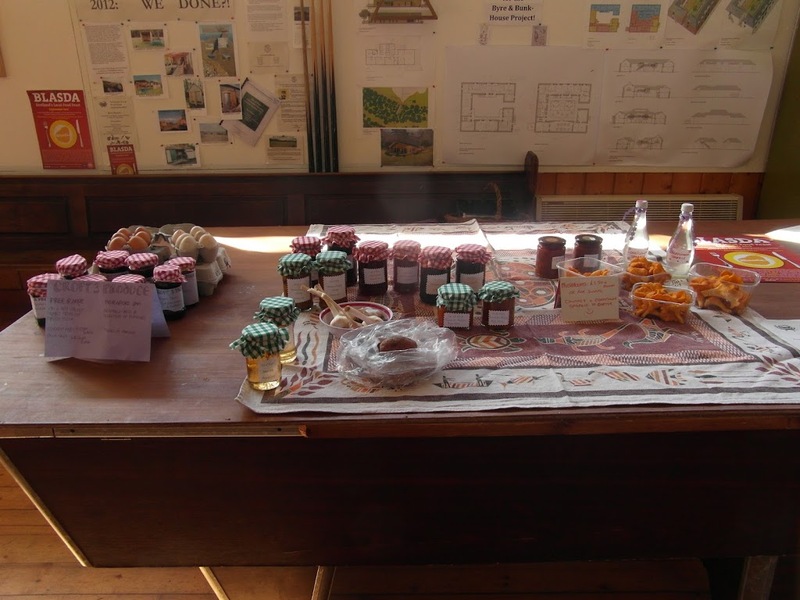 The events team here had put together a great days programme with open gardens at four different homes including our croft, a market table groaning with local produce for sale or barter in the village hall and the crowning glory – a pot luck dinner in the evening. table full of produce – jams, jellies, chutneys and pickles, foraged mushrooms, home grown garlic and tatties, home brewed eldeflower fizz and freshly laid duck and chicken eggs. The evening was wonderful – loads of people attending a three course dinner comprising of food grown, foraged, gathered, reared, produced and prepared on the island. 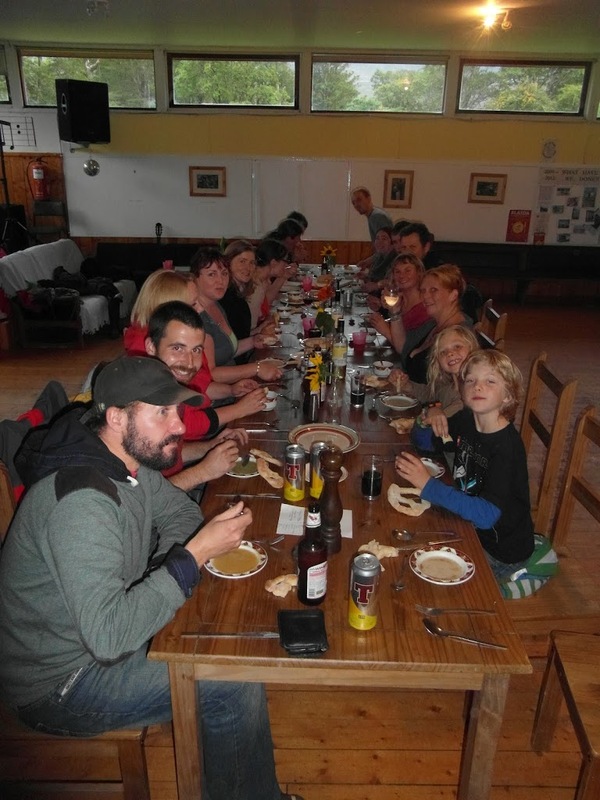 We had a choice of soups including spicy veg, courgette & mint or garlic, chervil & turnip, all served with home made bread. 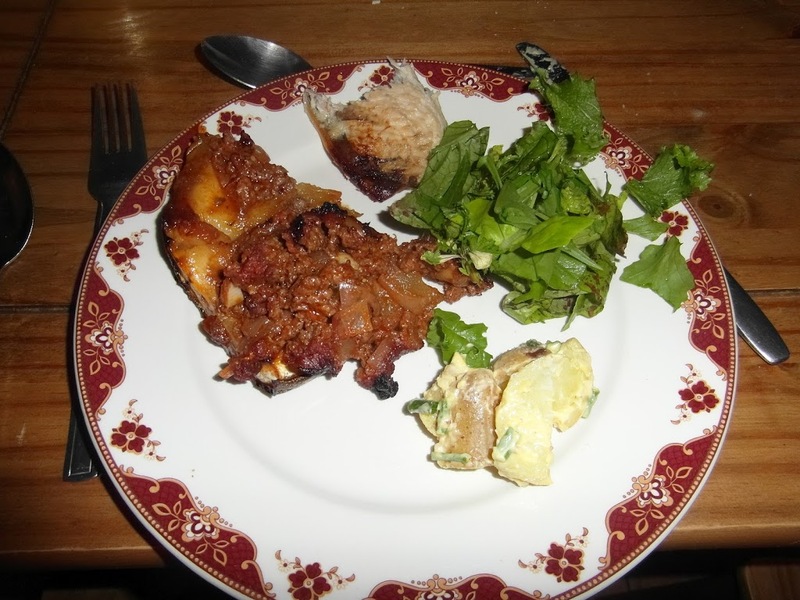 Main course selections were venison stuffed marrow, marinated mackerel, veggie quiche, potato salad and vegetable curry, also on the table to sample was home made mayonnaise, pickled beetroot, gherkins and nasturtium pods. Dessert was Brumble (bramble crumble), SNHapple tart (made with apples donated from SNH reserve office garden), custard made with free range Rum eggs and a gorgeous triple layer sponge cake. 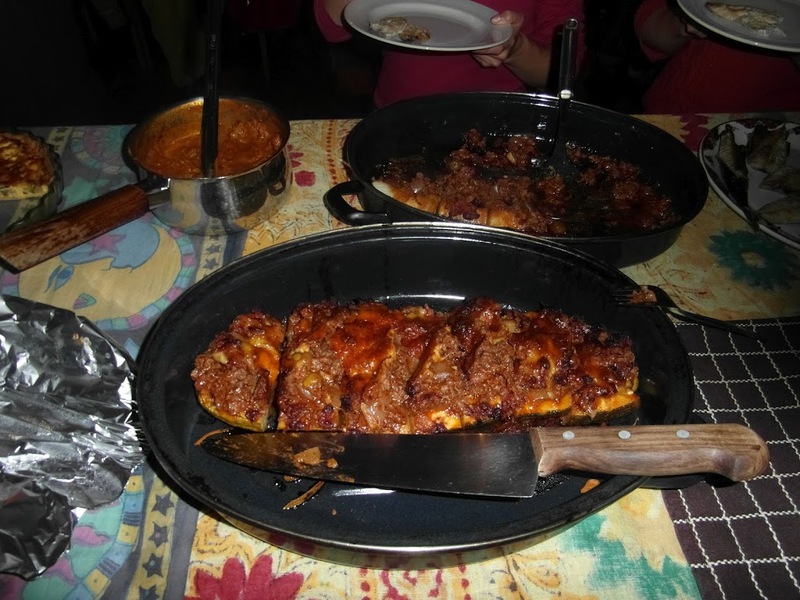 I think everyone left the table absolutely stuffed full of delicious food with barely one food mile let alone hundreds or thousands! It’s been a good week, filled to brimming with plenty of the sort of magical memories that keep you warm at night and feeling of community, home and promise of plenty more moments like this to come. 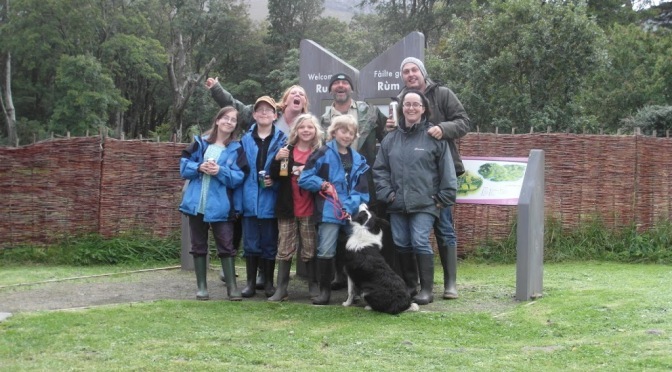 We’ve listed our compost loo funding project on the crowdfunder website. It’s for a limited period of just 60 days so it’s an experimental way of trying to find the compost loo project but I’m sharing here as we’ve already had a couple of investors from the site which is really exciting and means we are pretty close to 10% of the way there now. A productive few days on Croft 3 which has included taking down the fencing around the chickens, ducks and geese. On Rum we have no foxes so there is no need to keep the birds safe from them and all of the birds free range around the croft anyway. I love looking up or down the hill and seeing the chickens scratching around, the two wee chicks scurrying behind their mother hen, the ducks enjoying a paddle in the drainage ditches and the geese practising being menacing and honking and hissing. The fencing was only serving the purpose of meaning when we go to feed the birds and collect eggs we are penned into the muddier areas so we have taken it down and plan to put some stepping stones in to create a path and let the mud subside. In other exciting news this week we have sold our first duck eggs 🙂 Jinty agreed to try half a dozen in the shop and they sold within the first day. Another couple of dozen heading down there tomorrow along with some chicken eggs too. We have been using them ourselves aswell though – Dragon made his first home made custard this week with some yolks while Star made good use of the whites to whip up some meringues. Eggsellent! Meanwhile I have been experimenting with brambles – my latest is blackberry and ginger jam now my lavender is over for this year. It’s delicious although the set is a little soft so it’s better spooned on than spread! We now have about 20 jars nestled in the cupboard. We had mackerel for dinner this week – some caught by us, some brought up by Kate who came for dinner, all caught off Rum pier. The coming week sees more friends visiting us – they are already in Mallaig so we’re waving across the sea at them and counting the hours til the ferry brings them tomorrow. They are fellow intrepid types, about to head off on their own traveling adventure next year so we’re really looking forward to showing them where we have settled and hearing more about their roaming plans. We’ll also be celebrating our second Rum birthday as Dragon turns 12. Today Ady and I celebrate our 13th wedding anniversary – September is a busy month for us even if no one is going back to school! 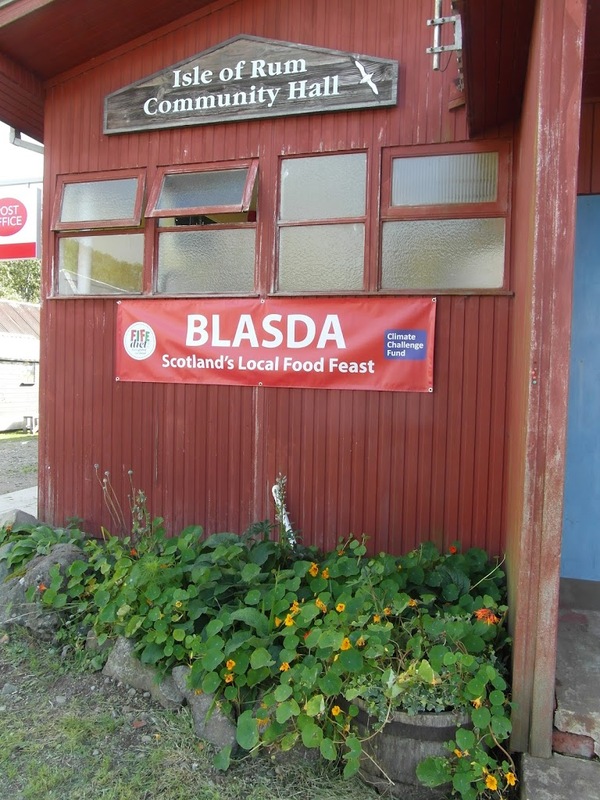 We are really excited to be part of Rum’s Blasda festivities too including the official opening of the community polytunnel which is cited here on Croft 3, market produce, bring and barter, an evening feast of local food and open garden events around the village. I have jars of jam, eggs and plan to do some baking to take along to sell or swap and we’ll be showing interested parties around Croft 3 and sharing our plans for the future, letting people pet our pigs and go gaga over our geese and ducks and chickens. It’s going to be a blasda day! 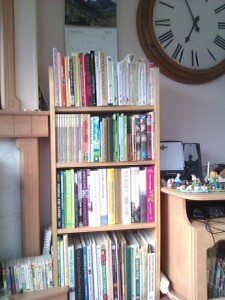 This week we have been watching Grand Designs with the kids. We watched the episode with the earthship inspired build in France and a couple of other eco-builds. 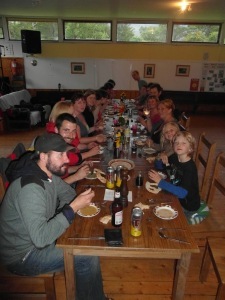 We’ve also been thinking lots about our WWOOFing adventure as we head for the first anniversary of our last host. On Grand Designs Kevin was incredulous at the volunteer help or ‘slave labour’ as he termed it of willing hands helping to shovel earth into tyres for nothing other than a learning experience, cameraderie and being part of something amazing. 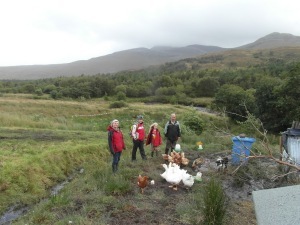 I was reminded anew of similar opinions being aired about our WWOOFing – working hard? For nothing? Or on behalf of our WWOOF hosts – putting up four people for a few hours work a day? Feeding them and looking after them in exchange for a bit of unskilled labour. So why are we asking for funding for our compost loo? Why have the people who have already donated done so? Why did we go WWOOFing and why do we get on average 5 emails a week from people interested in WWOOFing for us? 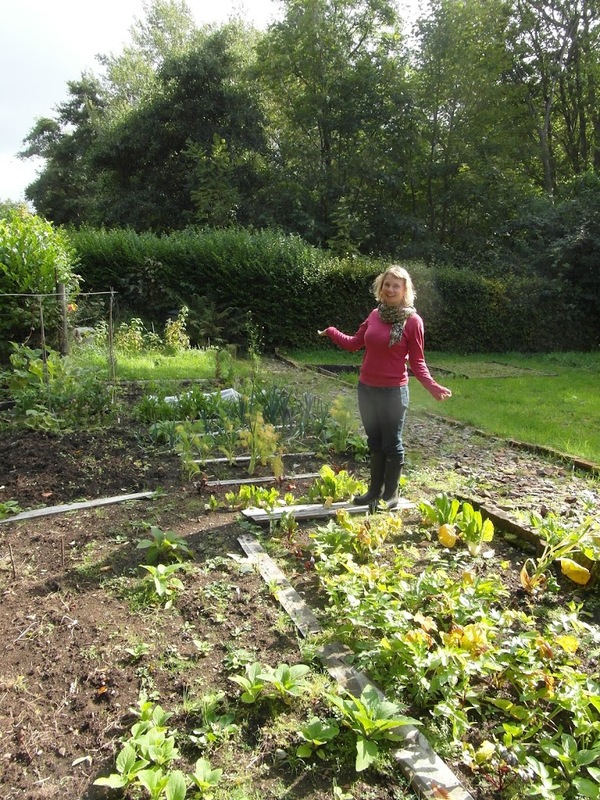 Why are there hundreds of WWOOF hosts in the UK including ourselves? I think it’s about being part of something bigger than ourselves, something greater than the sum of it’s parts. A single violin, a drum, a trumpet can all sound impressive and beautiful when played alone but when all the instrument join together in a large orchestral performance there is a certain magic created. A lone voice shouting of injustice is easy to ignore yet a peaceful demonstration by a large crowd of protesters has impact. When we left Sussex and had a leaving party it only worked when friends arrives with music, food, drink, voices, laughter, people. We knew when we took this great big leap of faith into moving to Rum, becoming crofters, building a new life and home and joining the community here that we couldn’t do it alone. We knew we would need friends, helpers, volunteers, we knew we’d need people. I can’t wait to reach the point where we can share this amazing place with others – start to fulfil our dream of creating somewhere to inspire, to educate, to learn. I can’t wait until we can show people our home and explain that yes, you really can live off grid, without being hooked up to mains water, gas, electricity. You really can grow lots of your own food, rear your own livestock, barter your produce for what you can’t grow or make yourself., live without a 24 hour supermarket. I reckon we’ve funded half the roof! Or at the very least a whole load of loo roll and antibacterial handwash! Thanks to the generosity of three donators we already have raised £120 – that includes a donation from Paul at Free Range Designs and a promise to hold the price for us on the compost loo at the previous quoted price although they have just gone up. We can’t thank you enough 🙂 I’ve had our pitch accepted on the crowdfunder website too – as soon as it is live I will link to it. We’re thrilled to have started raising funds towards the compost loo and really appreciate the positive feedback and messages we’ve had so far – if you are able to help spread the word – twitter / facebook / linking from your blog it is hugely appreciated and just as much help as donating. Readers who have been with us since this time last year will know we were about to embark on our wild camping part of our traveling adventure in September and October 2011, still with no real idea of where we’d end up at the end of our year. We had various objectives for that section of our plans which included seeing red deer, golden eagles, the northern lights, leaping salmon…we also wanted to do some hunting, fishing and foraging. We ticked a lot of things off our list, although the irony of how many of the things which were such a novelty for us this time last year yet are now a part of our daily lives here is something we remark on almost daily. We look out of our bedroom windows at red deer, sea eagles and golden eagles every day, in the last hour while sitting typing with a cup of tea I have watched a pair of sea eagles soar overhead and two deer in the field next door. We’ve yet to see the northern lights but are coming close to the time of year when they may be visible and I have seen spectacular photos of them from Rum in years gone by so fingers remain firmly crossed for that yet to happen. we never managed this while travelling but it forms part of the rhythm of our days and weeks here on Rum. The wild larder here is jam packed with produce. I have gathered raspberries and blackberries weekly for the last few months and been turning them into jam, cakes, pies and crumbles – for us, for sale and for stashing for the winter months ahead so we can open a jar of August sunshine to spread on our homebaked bread even when it is February outside. We’ve picked herbs growing wild including mint and Ady has enjoyed foraged mushrooms (I don’t like mushrooms, neither do Dragon and Star). We missed the gorse and the elderflowers this year but did pick a bucket full of broom flowers which were lovely with salad. 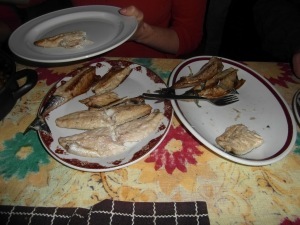 We have eaten mackerel and pollock for lunch and dinner on several occassions, pulled from the sea with our tiny fishing rods and onto our plates within hours. I’ve experimented with rowan berries and plan to make some more rowan jelly to accompany the next big treat coming – Rum venison. The deer cull is in full flow and Ady and I are very excited to be doing butchery training next month and being part of a new community interest company on the island, Rum Venison Processing, hoping to be up and running and selling lovely venison cuts and produce to locals within the very near future. We’ve had a handul of fruit off our soft fruit trees (raspberry, blackcurrant, redcurrant and gooseberry) and of course we are rich in eggs from our chickens and ducks but we have yet to get any other crops started on the croft. Come next year we will be dining on our own produce as often as possible but it’s very exciting to be living somewhere where we literally pull handfuls of free food off the trees as we walk by, watch nuts and berries ripen on the trees ready for next season, have an ever changing menu of fish swimming by in our rivers and lochs. Ever mindful of only taking what we need, sharing with the other locals and most importantly the wildlife, along with leaving enough to guarantee a supply for coming years. It is a lovely feeling to be nourished by our island and feel so provided for.